Keynote at Usability And Accessibility Days 2014 - Engagement, Athens, 10th December 2014. A. Dix (2014). Long-Term Engagement. 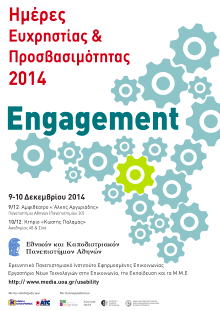 Keynote at Usability And Accessibility Days 2014 - Engagement, Athens, 10th Dec. 2014. In this talk I identify three layers of engagement. The first is short term, the moment-to-moment engagement in interaction with a system or device; this is linked to issues of immersion, flow, and is often the main focus of usability and UX design. The second and third are longer term and the primary focus of this talk. The second is the way in which people repeatedly and through choice engage with systems over many interactions and extended periods of time; this is related to adoption, system design and what Haliyana Khalid and I have termed extended episodic experience. Finally is the way in which organisations and communities engage with new technology as a whole accepting and potentially embracing it; this is linked to issues of participatory design, enculturation, co-design, community action, social identity and empowerment. I draw on examples and experience from multiple projects I have been involved with. One aspect of this is through my role in Talis, understanding the nature of the academic life for effective exploitation of learning analytics. Another comes from extensive engagement with rural communities through activities on the small Scottish Island of Tiree and a recent 1700km walk around Wales. This rural engagement has led to a recent white paper/manifesto on Open Data Islands and Communities, questioning the way big/open data can be of value at the grass roots in small communities whether rural or urban, and the way in which ordinary citizens could regain control over their own data.